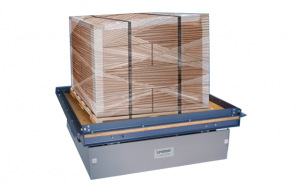 Lansmont’s MS-2000 Package Shaker Systems are used to perform standard “repetitive shock”, “loose load”, or “bounce” tests in accordance with ISTA, ASTM, TAPPI, ISO, MIL-STD, FED-STD, UN, DOT, and other industry, government, and international standards. These machines operate on an eccentric cam principle, and are adjustable for circular-synchronous or vertical linear motions. The operating Frequency range is from 2 Hz. – 5 Hz., with a fixed 1-inch displacement and a maximum acceleration of 1.25g peak. Lansmont’s Model MS-2000 Mechanical Shaker includes the following features. 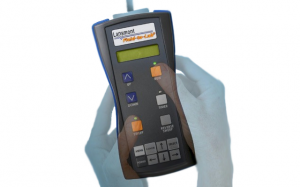 The handheld controller is a lightweight, ergonomic control box designed for hand-held operation. All control features of the MS-400 and MS-2000 Package Shakers are incorporated into the design including Power On/Off, test setup, and Start/Stop functions. An LCD screen displays all pertinent test information—rotary speed, frequency, test durations, and acceleration level. Package Shakers come standard with a variable-speed DC motor, driving a synchronous belt, which provides quiet, smooth operation of the test system. Allows for operators to use optional safety systems, such as pressure sensitive safety mats or photocell light curtains, which disable the test system when triggered. 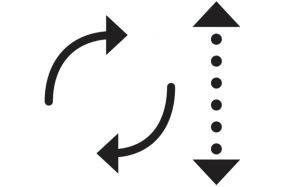 A positive lockout safety pin also prevents the carriage from moving when inserted. Package Shakers configured with a hi-end fence allows both for containment of test items on test bed, as well as an impacting surface when performing circular-synchronous or out-of-phase testing. Not quite the equipment size or performance level that you need? If we do not already manufacture the test machine ideally suited for your company’s testing applications, our engineering team can custom design a package shaker system specific to your needs. For more information contact us using the form on the right, or go directly to Lansmont Corporation.